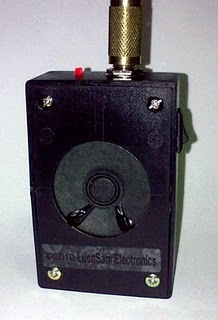 This is the first product produced and designed by LucnSam Electronics ( invented by C.G.Simon, ACE). It is a Small mini Guitar Amplifier (3.3" x 2.1" x 1.1"). It has one volume control, 1/4 mono jack, LED power on/off, 1.6" speakers and powered by one 9V battery. This product will be on sale soon at http://lucnsam.blogspot.com. It is the size of cigarette box. It so small you can put it inside your pocket and carry it any where with you to Jam Session. It a mobile guitar practice amp. Watch the video below to hear the mini guitar amp METEO-45SP in action. I wish I had one. It would be a world of difference for me as I play my way through my guitar tabs.